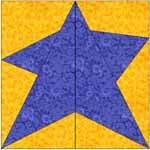 The Star from The Alphabet Quilt: The star block is the design used for the corner blocks in The Alphabet Quilt. 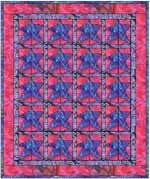 There are 26 Letters in the alphabet, and to make the quilt come out even you need four more blocks. 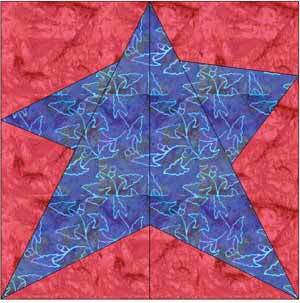 In the example they are placed in the four corners. 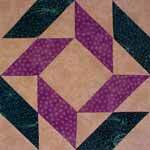 This block can also be used in a quilt by itself (see examples below). 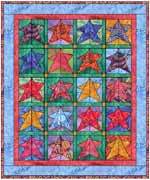 Make sure to read the Alphabet Quilt General Instructions before beginning. Make one(1) copy of the Star. It has two sections. 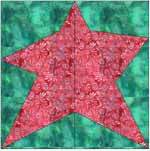 You will piece each section separately and then sew the two sections together. Piece in numerical order. On the first half of the block, place 1M face up on side of the paper without lines by placing a small amount of glue stick in the center to hold it while you place the second piece. Continue adding 4M, and 5B. Press between each step. On the second half of the block, place 6M face up on the side of the paper without lines by placing a small amount of glue stick in the center to hold it while you place the second piece. 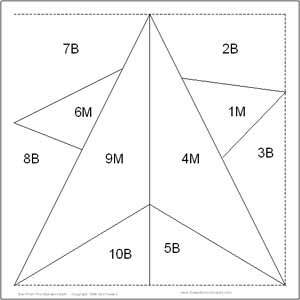 Add 7B, 8B, 9M, and 10B. Pressing between additions. Add Section One to Section Two, matching seam lines. Rip paper off on seam allowance between sections and then press this seam open. I usually finger press this seam, and then lay it paper side down on the ironing board and press from the fabric side of the letter block. Trim excess fabric and paper to �� around the finished size of the letter.